Being able to share an app with a customer, a colleague, or a friend so they can test and run an app is a core benefit in a mobile platform. Since the beginning, the Appery.io platform has made it very simple to test and run you mobile app in the browser or as a hybrid app via the Appery.io Mobile Tester app for iOS and for Android. With the tester app, you can run and test your hybrid app, including any native APIs, without having to install the app on a device each time. We are happy to announce today that anyone can test and run your mobile app via the Appery.io Tester app—even without an Appery.io account. This means after installing the tester app, anyone can try your app! One of the best ways to test your mobile app is on the device. 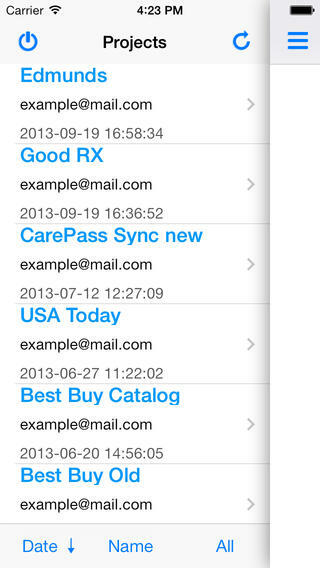 This is a must if your app uses native (PhoneGap) API such as the Camera or the Barcode scanner. Installing the app on the device after every small update is very time consuming. That’s exactly why we built the Appery.io Tester app. It’s a very simple app that allows you to launch your native app and test any native APIs without needing to install it each time. We had the Android version for some time now and now we have also launched the iOS version. Once the app is installed, sign in with the same credentials as you use for https://appery.io and you will see a list of all your apps. Simply select the app you want to launch and start testing! This allows you quicly to test any native APIs used in the app. If you make any changes to the app (in Appery.io builder), simply relaunch the app to get the latest version. It’s that simple. For more information about testing your app, please visit Testing your app in documentation. For Android, you can get a ready for the app market binary file (Release binary). Just take the file and upload it to Android Market. It’s that simple. You can watch a webinar where an app is built, exported for Android and published. iOS is little bit more involved (Apple requires to provide your developer information to build). There are two ways to go about it. First, export the app as xCode project and then follow the steps outlined in this guide to build the app. A second option is to use PhoneGap Build cloud service. We are working on adding functionality where you will be able to build iOS app inside Appery.io. Recording of our Learn How to Build Mobile Apps in the Cloud with HTML5, jQuery Mobile, REST, and PhoneGap webinar. So you built a really cool mobile app in Appery.io, now you want to export Android app sources and open in Eclipse. Here is how to do it. Recording of our webinar from November 16th: From an Idea to Android Market in 40 Minutes. One of the great things about Appery.io Mobile Apps Builder is its support for end-to-end development, going all the way from an idea in one person’s mind to an app running in thousands of phones. In this webinar, we’ll show you exactly how it’s done (and how easy it is) by walking you through a hands-on example. The focus will be on exporting options for apps. In this case, we’ll export an Android binary (.apk) and publish to the Android Market. Of course, we’ll quickly build an app first, so you can learn or refresh your memory about how to build the UI with jQuery Mobile, connect to REST services, and test the app. Appery.io Mobile Apps Builder (Exadel) is going to be at AnDevCon II (The Android Developer Conference) in San Francisco Bay Area, November 6-9. Stop by our booth and learn how to build Android apps ready for the Android Market using cloud services, all in about 5 minutes. It’s really awesome, I promise. In this cool session you will learn how to build HTML5 and native apps using Appery.io. Appery.io is a cloud-based mobile apps builder that uses HTML5, jQuery Mobile, REST, and PhoneGap to build apps. A real mobile app will be built during the session, which attendees will be able to run and test on their own devices. Sign up to attend this Meetup.